Backed by the country’s Islamic leaders, Brunei’s sultan has banned Christian symbols and celebrations. Violators can be fined US$ 20,000 or get up to five years in jail. The authorities fear Christmas might “damage the aqidah (beliefs) of the Muslim community." However, some have dared to challenge the ban on social media with the #MyTreedom hashtag. Bandar Seri Begawan (AsiaNews) – Brunei, a sharia-ruled small sultanate in Southeast Asia, continues to ban Christmas. Muslims and non-Muslims who celebrate in public Christmas can expect a fine of ,000, up to five years in prison, or both. Brunei’s sultan outlawed the Christian festivity last year on the grounds that celebrating it "excessively and openly" could lead his Muslim population astray. Since then, local Islamic religious leaders have backed him. Christians and others can still celebrate Christmas, but must do so in private and have to warn the authorities beforehand. The list of offensive practices include: using or wearing Christian religious symbols like the cross, lighting candles, making Christmas trees, putting up decorations, wearing Santa hats, singing religious songs, and sending Christmas cards. For Brunei’s Ministry of Religious Affairs, "enforcement measures are . . . intended to control the act of celebrating Christmas excessively and openly” because they “could damage the aqidah (beliefs) of the Muslim community." 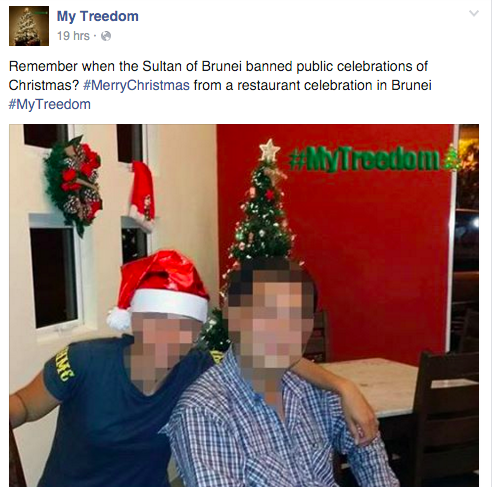 Undaunted, some people in the Sultanate (pictured) have challenged the ban by posting Christmas pictures on social media using the #MyTreedom hashtag. The same is happening elsewhere, even in countries like Saudi Arabia, where Christian symbols and festivities are also outlawed. Brunei is oil-rich, producing on average about 180,000 barrels a day. With natural gas, oil represents half of its annual gross product (GDP). It is ruled by an absolute monarch, Sultan Hassanal Bolkiah, 69, who introduced sharia in the spring 2014. The latter applies to both Muslims and non-Muslims, and imposes the death penalty by stoning on adulterers, homosexuals, and blasphemers, amputation on thieves, as well as flogging for other offenses such as abortion and drinking alcohol. Sharia enforcement on all residents, regardless of religion, has been quite draconian. In recent years, political pressure on civil society has increased with local media highlighting conversions from Christianity to Islam. Conversely, Muslim converts to other religions can expect the death penalty for apostasy. The small nation of 400,000 shares Borneo Island with two large Muslim nations: Indonesia and Malaysia. Its official language is Malay, but English and Chinese are widely used. Since independence, it has become a developed country. Almost 70 per cent of its population is Muslim and ethnic Malay. About 13 per cent is Buddhist, mostly ethnic Chinese, followed by indigenous people and other minority groups. Christians are about 10 per cent, 70 per cent from the Philippines, 20 per cent from Indonesia, and 10 per cent indigenous. About 10 per cent of the population does not profess any religion.